The first juice of the year usually rolls off the press in September so look out for it in a shop near you! Duskin Apple Juice started in 1980 and has been pressing individual varieties ever since. We cannot claim to be the first; after all, the idea of removing the juice from an apple must be as old as the apples themselves. However, more than 30 years has got to be some kind of record. Duskin has been producing single varieties since the beginning. The process is low-tech and low-volume which allows single varieties to be kept separate, allows the natural flavour to remain largely unchanged and "in the bottle pasteurisation" preserves aroma. Kent is often referred to as the Garden of England, with good reason, and every good garden should have an apple tree if it possibly can. Kent is lucky, it has thousands of them. At Duskin Farm we are privileged enough to not only live in this Garden but also to bottle it. Kentish apples grown, pressed and bottled in Kent. One sign of genius is when it makes you say "Oh, of course." I remember this whenever a first time taster says "Oh, it tastes of apples!" Duskin take the juice out of an apple and put it into a bottle. If you like the apple, please try the juice. We use only local Kentish apples, pressed in season to avoid long cold-storage. Our In-the-bottle pasteurisation process preserves flavour and particularly aroma. We use no additives except for a tiny amount Vitamin C as an antioxidant and we use minimal packaging - we like to keep everything simple. 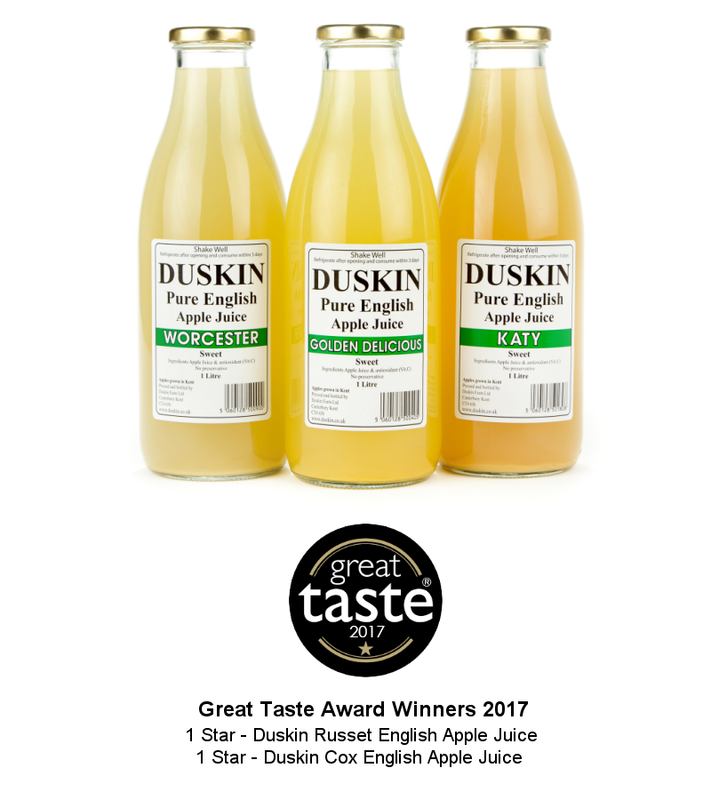 Duskin uses apples in single varieties, of which there are well over two thousand. We believe that Kentish apples are the best for juice and we are very lucky to be in the Garden of England and source them locally. We currently produce 9 individual varieties. Just English apple juice in a bottle.